VATICAN CITY (CNS) — Without waiting for some well-researched, detailed plan with action items and measurable goals, Catholics in Quebec must go out and share the Gospel, Pope Francis told the bishops of the province. Meeting the 29 bishops of Quebec May 11, Pope Francis said, “You’ve got to go, and it’s going to be messy,” according to Archbishop Paul-Andre Durocher of Gatineau, former president of the Canadian Conference of Catholic Bishops. The two-hour meeting was the second the Quebec bishops had with Pope Francis during their “ad limina” visit to Rome to pray at the tombs of the apostles and to discuss the situation of their dioceses with the pope and Vatican officials. 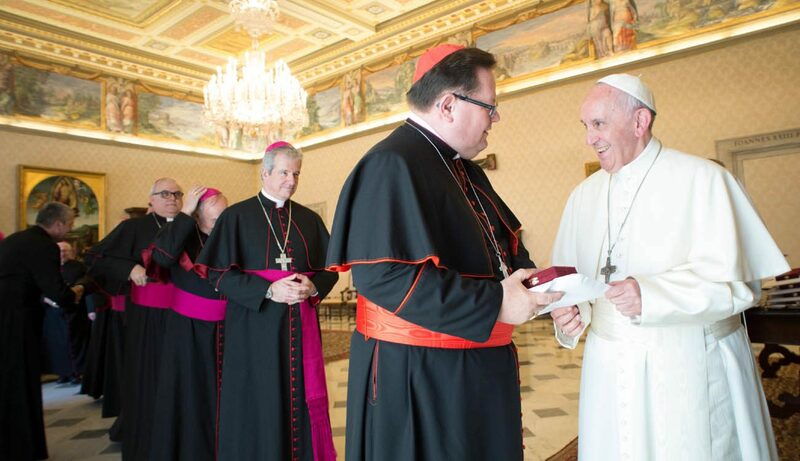 The Quebec bishops also had met with the pope for three hours May 5 at an evening meeting that included the prefects or secretaries of the Vatican offices for bishops, clergy, religious, laity and family, Catholic education and the Congregation for the Doctrine of the Faith. Pope Francis hosted a similar meeting with curial officials and the bishops of Chile during their “ad limina” visit in February. The bishops have been in Italy almost three weeks because their two-week “ad limina” pilgrimage was preceded by a weeklong retreat. Although it has been 10 years since the bishops had made an “ad limina,” Archbishop Durocher said his “heart is torn” because so many people back home are suffering the effects of severe flooding. Pope Francis “realizes we’re not alone in that” and mentioned similar situations in the Netherlands, Belgium, Ireland and parts of Spain, the archbishop said. Before the great changes in Quebec in the 1960s, he said, the Catholic Church and its religious orders operated almost all the schools and hospitals — there was not even a provincial government department of education. The church was “omnipresent and omni-invasive,” the archbishop said. Sensitivity to the benefits of church-state separation and a Catholic-inspired push to strengthen civil society combined with secularism have led to a situation, he said, where the church is pushed almost completely out of most people’s lives. Pope Francis, he said, urged the bishops to start immediately and be creative, even without detailed plans and even knowing that some of what they try will fail. “It fits in with what I’ve told priests when I’ve said, ‘We’re going to try this’ or ‘We’re going to try that’ and they say, ‘We tried that before and it didn’t work,'” the archbishop said. His response is a hockey reference: “You don’t score every time you shoot on goal,” and if you stop trying after three failures, you might as well put away your skates. The church must be at the service of the Gospel and the people of the province, he said. It makes no sense, for example, to rebuild hospitals and schools when the government is providing health care and education, he said. The church must meet unmet needs and preach the Gospel to a population that mostly considers God and faith to be unimportant. Pope Francis’ responses to the bishops’ questions and his comments on what they shared emphasized the need to step out, to listen to people, to discern where the Holy Spirit is leading the church and to promote the “full blossoming” of laypeople’s involvement in the church and its mission, Archbishop Durocher said. The role of women in the church, he said, was discussed “in the context of where is the Spirit pushing the church.” Pope Francis told them it is “vital” that more women be involved, including in decision making, “but the problem is that we cannot reduce it just to a question of function” — offices they can and cannot hold — although that is important, too. “He was very clear that we need to bring the voice of women into the responsibility structures of the church,” the archbishop said.